There is no such reporter in Mercury Falling. The story, which is, as it were, told directly, concentrates on a year in the life of its hapless protagonist, Jimmy Devlin, and his attempts to survive on whatever work comes his way in this bleak, inhospitable environment. The novel opens with Devlin, still abed in mid-morning, being knocked up by a bailiff. Skelton, as the bailiff is called, has instructions to throw Devlin out of the abandoned, rotten farmhouse where he has been living for months without paying the rent he’d agreed on with the owner. (We’ll later discover that the owner has plans to flatten the building, which is in unrentable condition.) Devlin puts up a pathetic show of belligerance, contemptuously knocked away by the bailiff: ‘the law,’ Skelton says, ‘is always on the side of money and them what has it and them what’s owed it.’ Devlin grabs a rabbit gun and fires it at the bailiff, nicking him in the arm. The action, stupidly ineffectual though it is, will come back to haunt him. He knocked on the door and stood back. His sister unlocked the door, opened it a few inches and looked out at him. ‘What is it this time,’ Ellen said. didn’t appreciate her having visitors when he wasn’t present. There’s not much to be said in favour of Devlin. But then that’s true of most of the people he encounters. He inhabits a world of petty crooks, fenland spivvery, where there’s no honour among thieves. Like him, most of the younger men claim to have ‘done their bit’ during the war, which in his case turns out to have been time in Colchester military prison when, as a reluctant conscript, he tried selling red petrol to a garage owner and was ‘Caught, charged, found guilty, imprisoned, all in the space of a week.’ (Red petrol had been coloured to prevent its use for civilian purposes.) Like Hedgehog Bill, Devlin claims to be able to mend car and lorry engines. He tells this to the foreman of a gang of men he’s working with, draining a dyke, and the man laughs at him. ‘“you and a million others, chum, you and a million others,”’ the foreman says. The man who remembers seeing Devlin in prison is Ray Duggan, the unashamed champion of ‘looking after Number One’. Duggan is an intriguingly imagined hard man, in whose flood-damaged house Devlin becomes for a while a lodger and by whom he’s recruited to help out on nights when Duggan goes off in his lorry to steal anything that, word has it, is available. He has no compunction about lifting whatever he can, whether it’s Government paid-for machinery dumped by the roadside preparatory for use in draining flooded fields and dykes, or sacks of shellfish waiting to be collected by the fishermen who’ve patiently garnered them from river and inlet. Everyone, Duggan implies, is at it, but his reputation as a hard man ensures that he gets what he wants and sells to whom he chooses. The first part of the novel covers the summer months when Devlin finds seasonal work and even a woman, the sister of two gypsies he falls in with after Duggan has thrown him out. They are fairground workers – gaffs (though Edric doesn’t use the term) – and they offer Devlin shelter in a rotten caravan, for which he pays by helping them with their night work. He goes so far as to lead them to a cache of stolen goods he’s earlier helped Duggan thieve, and the twinge of emotion he feels when he does so ’less of conscience than fear that Duggan will guess who tipped ‘the gyppos’ off and will sooner or later come looking for him. But then winter arrives – Edric evokes the look of the wintry landscape in a number of terse, exactly judged paragraphs – and work drops off. Mercury is falling. In the novel’s second part Devlin’s fortunes take several turns for the worse and as they do so he spins increasingly out of control. He trashes Skelton’s house, he sets fire to the gypsies’ caravan after they’ve turfed him out, and then, in a kind of grim pastiche of some Hollywood Western, he makes his way to Duggan’s broken-down house, armed with a shotgun he found in the course of wrecking Skelton’s place. Mercury Falling has any number of such moments. This may suggest that the novel is a kind of dour, latter-day Gissing. (Although Gissing is far better than most accounts of him would suggest.) 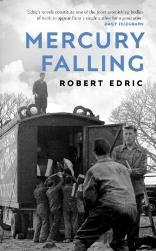 But Edric is far too good a novelist to be content with drab reportage. His novels are a long way from plain cooking made still plainer by plain cooks. Although both his eye and ear for how people look, how they talk, how they behave, how they live are enviably good, he is also a masterly contriver of narrative, and he invariably gets onto really interesting subjects, or anyway subjects he makes interesting. It is something of a scandal that so good a novelist shouldn’t have a larger reputation. Yes, he has, quite rightly, won prizes, including the James Tait Prize, the W.H.Smith Literary Award, he has been twice long-listed for the Booker, and short-listed for the Dublin Impac Prize. But he isn’t, as they say, fashionable, which translates into ‘not from Bloomsbury, Hampstead,’ and, as the late, great Roy Fisher used to remark, ‘a few spots round that way.’ There is, after all, a world elsewhere.